Playing with Papercrafting: It's Here! The Occasions Catalogue and Sale-A-Bration! It's Here! The Occasions Catalogue and Sale-A-Bration! Well, the waiting is finally over and the best time of the Stampin' Up! year is here! SALE-A-BRATION! The next 3 months stretch ahead with the possibility of all kinds of rewards from Stampin' Up! First, you can now order from the Occasions Catalogue! Click on the catalogue cover below to take you to the PDF file that you can download. Hopefully, that will hold you until you get your hard copy from me! Enjoy browsing and when you're ready, let me know what you'd like. I will be posting my top ten list in a couple of days, and I'll see if there is interest in some product shares! For every $60 you spend on one order, you can choose a free reward from the AMAZING Sale-A-Bration Brochure! There are so many great high-quality rewards to choose from! And for the first time, this year there is a second level of rewards that you can earn if you spend $120 on one order (or you can opt for 2 Level 1 rewards if you prefer!) And you can do that as often as you want until March 31, 2018! 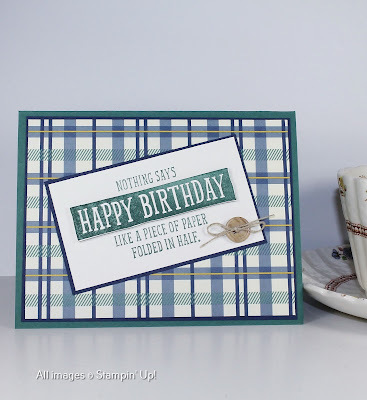 If you host a Stampin' Up! 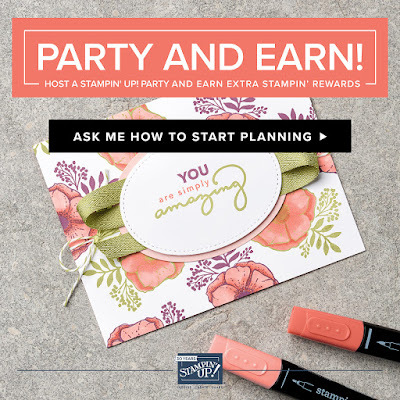 Party of any kind, or if your host month for my Stamp Club falls in January, February or March, you could earn extra Stampin' Rewards from Stampin' Up! If the total sales from your party reaches $330 or higher before tax and shipping are added, Stampin' Up! will add an extra $35 in rewards to the normal rewards you already get! Bonus!! THIS! This is the best deal of all! 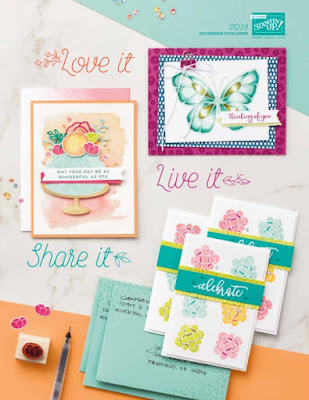 Purchase the Starter Kit during the months of Sale-A-Bration, and Stampin' Up! 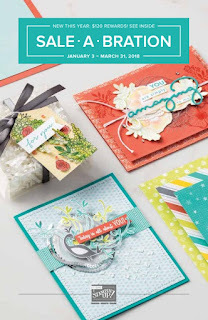 will add TWO additional FREE stamp sets of your choice to your kit! Depending on the sets you choose, that could be up to a $132 value! And you already get $165 worth of product of your choice for only $135 with free shipping! I'm telling you, if you are a bargain hunter, this is the best deal out there. There is no risk and no strings, but there is the possibility of having a fun, satisfying career of your own where you can be your own boss and choose your own schedule! Demonstrators get a 20% discount on all their purchases, working up to a 25% discount, plus many other ways to earn as well. If you join during Sale-A-Bration, you can enjoy a minimum of 4 months and a maximum of 6 1/2 months of earning the discount, plus many other benefits as well. My team has access to two Facebook pages, a strong local support group, team meetings when you want them and a wonderful community of new friends! Okay, enough of that! 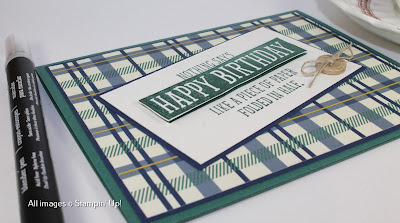 I want to quickly show you a card I made using the True Gentleman Designer Series Paper and the Birthday Wit Stamp Set, both from the new Occasions Catalogue! Something tickled my funny bone when I read the sentiments from the Birthday Wit stamp set! I actually laughed out loud. This was the first one that caught my eye! The other one says "They say if someone forgets your birthday, you don't get any older that year." and it pairs with the inside sentiment "You're welcome!" Obviously for a belated birthday card, it makes it look like you were doing them a favour by forgetting their birthday! Hahaha! 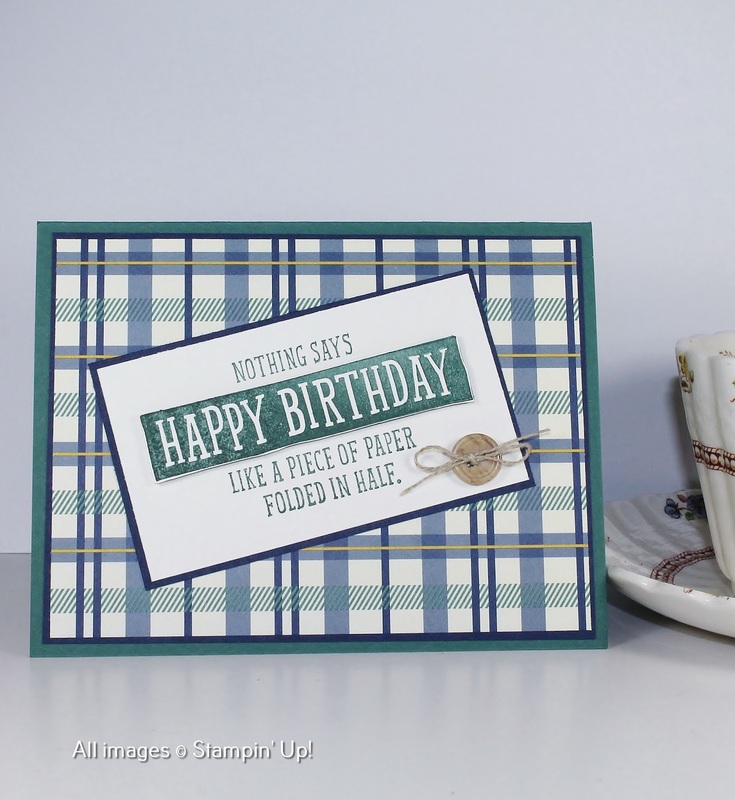 The Designer Series Paper is from a wonderful masculine set called the True Gentleman Designer Series Paper. I love the combination of Night of Navy with Tranquil Tide and Very Vanilla! 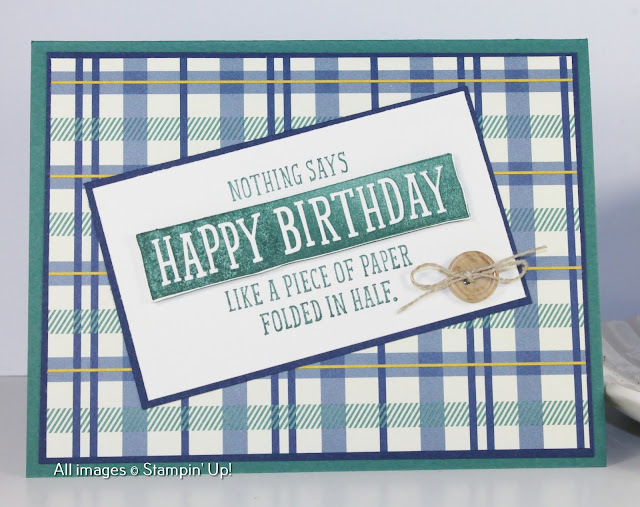 This is a fairly simple card featuring a double stamped sentiment, one of which has had the solid Happy Birthday negative rectangle fussy cut and mounted on the other with Stampin' Dimensionals. I made this card for a shoebox swap our team is having for our January meeting so that we'll have lots of samples to use for our January classes. It needed to be super simple as we'll be making a lot of them and won't have the time for lots of steps in each one. 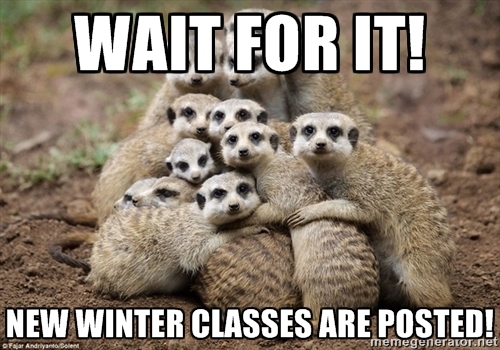 I have my schedule of Winter Classes now posted through to March. Take a peek by clicking on Classes on the top menu.